We're in a unique era where content, instead of traditional advertising, is intersecting with commerce. From blogs to YouTube to Instagram, more and more people are turning to content to share their skills and turn their knowledge into lucrative, respected businesses -- but how? How does one go from capturing their culinary adventures, travel, or enthusiam for cars, one day into doing it for a sustainable income, the next? I've got one word for you...passion. Now, what if I were to tell you that there was a step-by-step guide on how to get started; A sort of rule book that would help you write about what you love each and every day while also gaining a return on that investment with monetization? Sound too good to be true? Well, according to my recent read, Content Inc., by Joe Pulizzi, it's actually not. Don't believe me? Let's start with a Cliff Notes-esque version with my top 7 takeaways from the book, which will help you lay the foundation. One of the best things about digital and content marketing is technology has created so many different opportunities for you to create and deliver your brand's message. Some of you may not even remember a time when the only ways to communicate with a customer were fax, live events, direct mail, television, telephone (calling, not texting), radio, billboard, or print. Today, you have a plethora of digital channels (and virtually no barriers) through which to deliver your content to your potential, current, and past customers. This means you have endless opportunities to reach and engage people - but it also means you have to approach these opportunities intelligently and with a plan. Then it's like shooting fish in a barrel. It's not just about delivering content, it's about delivering strategic, custom content in the right way, at the right time to the right people. In fact, 90% of consumers find custom content useful, and 78% believe that organizations providing custom content are interested in building good relationships with them. 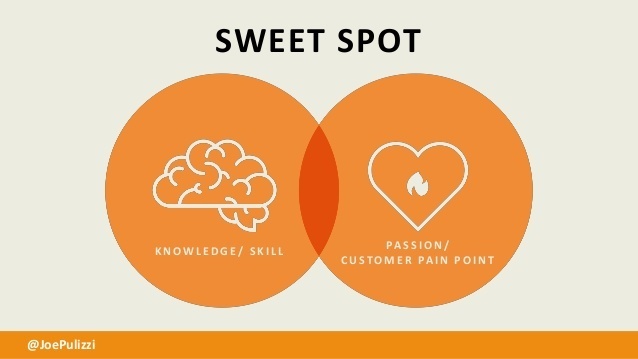 Identifying the Sweet Spot: This is where you find the intersection of your unique competency and your personal passion. If you’re already an established business, this is more likely to be one of your persona’s pain points. Tilting Your Content: Now you determine how you can “tilt” your sweet spot to a place where little or no competition exists. This will be the subject matter of your content. Building the Base: Next, you establish your number one channel for disseminating content (blog, podcast, YouTube, etc.). For B2B marketers, this is most commonly a blog hosted on your website. Harvesting Audience: As you create content in your chosen medium, you then use social media and SEO to convert one-time visitors into long-term subscribers. Growing your email list will not only help ensure return traffic to your content, but also give you a list of people who may potentially want to work with you in the future. Diversification: Starting with your existing audience, you begin to expand into new delivery channels. Monetization: Now that your expertise is established, you can begin exploring ways to charge money for your products or services. Knowing this process/strategy, take a look at where you want to be in 1, 5, or even 10 years. As you begin to not only visualize but actually write down how you are going to get there, you will probably realize that 1. you have no idea and 2. you are off-track to arrive there in time. That's not because you have failed, it's that you are simply looking at things differently than you likely had before. Taking the time to determine where you want to be and then actually writing down how you are going to get there can be a daunting task, but it's a task that is going to help you achieve those goals. In fact, people are 33% more successful in accomplishing their documented goals than those who merely talk about them. Dig a little deeper into your overall goals and filter them out to your marketing goals. Then, start writing those down each day, add in the follow-up task of consistently reviewing those goals, and you'll be destined for success. As mentioned earlier, at the intersection of knowledge (or a skill) and your passion, lies what Content Inc. calls 'The Sweet Spot,' and it's the first step to reaching success in Content Marketing. For many of you, these may not have intersected yet, and it might be difficult to even picture an overlap in what you love to do and something that you are knowledgeable about or particuarly skilled at. In comes brainstorming -- If you are reading, or plan to read, Content Inc. you will find a handy worksheet where you can list out your 'Knowledge Areas' and your 'Special Skills,' otherwise you can jot them down on a piece of paper. Go ahead...I'll wait. Once you have these listed out determining what you are passionate about should be the easy part; think about what you love to do, what excites you, what makes you feel alive. That's your passion. Now, according to Content Inc., if you are an existing company, or brand, defining your sweet spot will be a bit different. Instead of turning to a personal passion, it may be a customer pain point. Back in 2009, before Marcus became The Sales Lion, was the CEO of River Pools & Spas and the company was not doing well. Following the stock market crash in 2008, the economy was unstable and homeowners simply were not spending money on luxury items like fiberglass pools. River Pools & Spas was having trouble making ends meet and was beginning to think of closing its doors for good - but Marcus was not ready to go without a fight. He determined the only way to succeed was to beat out the competition, and the only way to do this was to offer something that they didn't -- educate them, make them a more informed buyer. So, Marcus started writing down customers' questions and common concerns, and then, using the expertise of River Pools & Spas he started answering them on his blog. When people went to search engines looking for answers, his articles and River Pools would be there. Over time, this 'Sweet Spot' morphed into an ever-growing audience, and the informational and relative content that Marcus created for River Pools & Spas became highly sought after by those in the market. Revenue increased from roughly $4 million to over $5 million, marketing spend went from $250k to around $40k, and needless to say, River Pools & Spas stayed in business. Marcus is now considered one of the greatest content marketers in the world, and River Pools & Spas, one of the most inspirational content case studies to date. Want to hear more from Marcus Sheridan himself? He'll be speaking and having personal one-on-ones at IMPACT Live 2017! Request your ticket today! Take a moment and think about the content that you currently create, or want to create. If it never existed, would it be missed? Would it leave an empty hole in your industry or market? If the answers to either or both of those questions is no - then you probably aren't creating the right kind of content or discovered your "Content Tilt." Create a Content Mission Statement that defines your core audience, the material that you will deliver, and the outcome of delivering that material. Determine which channels you should deliver your content. Not all channels are created equally and certain channels are better than others for each company. Determine what yours are and focus on them. Focus on your customer's needs. Make your content something your audience can't live witout; something they want (and need) in order to get them where they want to go. Not sure how to do his? Take Marcus Sheridan's approach and write down your customer's top questions to get started. Utilize Google Trends to help find your content niche. Talk to your current customers and readers. They are a landmine of information and insight. Determine the type of content you will create. Whether it's a blog, vlog, podcast, newsletter, or video, pick one specific medium to establish your core audience and become known for. You can also expand later. Research & Analyze. Spend time looking into your data; what are your current website viewers reading, where are they coming from, what are they engaging with and at what point are they exiting? This will help improve your strategy and get where you want to go. Never Stop Measuring. Once you've reached a point of success, benchmark it, and never stop measuring it, the minute you forget where you came from and what you've learned along the way the sooner you will get off track from where you want to be. Jay Baer is an excellent example of how to find your Content Tilt shared by Pulizzi. He was specific and determined the type of content he would create -- blog articles about email marketing. Then, he measured and researched what was happening with his content, noticing that when he posted about social media (instead of email marketing) his site visits increased from 150 to 1000+. So, he pivoted. He listened to what his readers wanted and found that the hole was not in content about email marketing but, in fact, content about social media, so that became his Content Tilt. Takeaway from this is actually an age old lesson from William Edward Hickson, "if at first you don't succeed,Try, try, try again." The goal of content marketing is to attract and engage with people so they see you as an expert and ultimately, trust and want to buy from you. Once you have gained someone's trust through quality content, they will be more receptive to your irresistible offer -- that is, something they absolutely can't live without and are willing to provide you with their name and email address to obtain. Now, this is where the monetization aspect starts to comes in, but keep in mind, monetization doesn't always mean dollars earned early on. When you're just getting started, you want to earn contact information to establish an audience of dedicated, loyal subscribers. Different from traditional advertising and marketing, the biggest wealth from your content marketing is in the number of subscribers that you have. Whether by email, blog or social channel, your subscribers are extremely valuable and are the key to your growth and long term success. These individuals will become those who regularly consume your content, and one day, may become your most loyal customers. In fact, 60% of consumers say they feel better about a company that delivers custom content, and are more likely to buy from that company. So, you found the Sweet Spot, love what you are writing about, have your Content Tilt, provide your audience with the information they crave, and are converting them into subscribers. First, As you provide consistent, quality content your audience will begin to increase and then your subscriber list will grown. As your list grows it becomes more and more valuable because you will then be able to nurture them towards your offer. This could be a free trial of your product or service, a helpful checklist, an eGuide or a downloadable demo - all of which are designed to get them to purchase your actual product or service. Moz started out as SEOMoz and was a blog dedicated to content about search engine opimization. The company built its subscriber base to over 100,000, then launched its subscription-based service software to them. Since their audience trusted them based on the quality content they had been providing, they were willing to try out the subscription service. Today SEOMoz is simply Moz and they have gone from a company producing roughly $450,000, to a company producing over $30 million - and it all started with Content Marketing. Now, for the second part of monetization -- the part that, if you are successful with your Content Marketing, will come to you on it's own accord, the ripples. Ripples, referenced in Content Inc., is a term coined by Doug Kessler of Velocity Partners, meaning "the unexpected benefits that come from a Conent Inc. approach, like an invitation to speak at an event, someone spreading the word about your expertise, or other unanticpaed benefits of becoming an expert in your field." Ripples are where you will really start to see some growth and where your Content Marketing can take you to levels you never thought possible. Let's go back to the River Pools and Spas example. Marcus Sheridan never would have expected that anwering his customers' questions through content would create a ripple effect of becoming an internationally-known content expert, being paid to speak at events and tradeshows around the world -- but this happened! It was an unexpected, but extremely valuable ripple and they are becoming increasing common. If you take nothing else away from this, let this be the one piece that sticks in your mind; you must, and I repeat must, be patient. 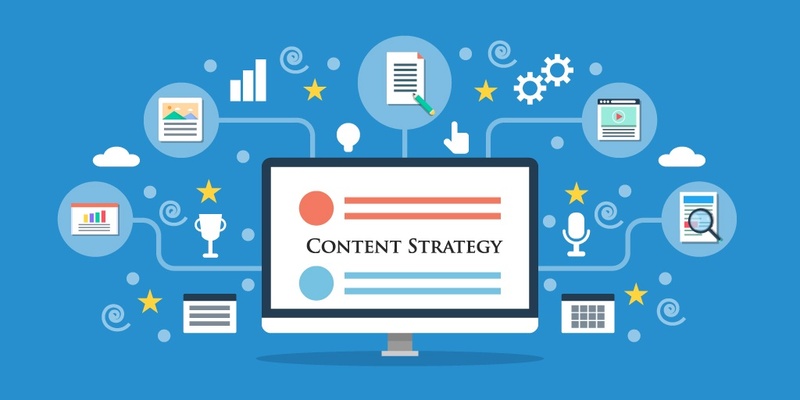 Success with content marketing or the Content, Inc. model is not going to happen over night. Why else do you think 2/3 of businesses survive the first 2 years and only half survive past 5? Especially with Content Marketing, which on average can take years to gain leverage, you need to enter your strategy and your business plan with patience in mind. Take the author of Content Inc., Joe Pulizzi, for example. He started in 2006 with Copyblogger.com, a site dedicated to Content Marketing, but it wasn't until 2010 before he found his stride, defined his vision, and finally felt like he was "onto something." Now, Joe leads one of the fastest growing private companies in the United States with a $10 million business. At the end of the day, you have to ask yourself, how valuable would it be to wake up every day doing what you love? How much time, energy, thought, vision and hard work is that happiness worth? Determine your answer and then apply it to your Content Marketing, and if you need more reasons than I have provided to get started check out Content Inc. - I promise you won't be disappointed. Want to hear more from Marcus Sheridan and learn more about how content marketing can shape and grow your business? Join us at IMPACT Live 2017, an exclusive, invitation only event for marketing and sales leaders. Request your invitation today!